Eddie Hall sustained minor injuries in the accident, which saw the gable brickwork of his neighbour’s wall come crashing down, writing off three cars in the process. Mr Hall, who lives in the West Midlands borough of Sandwell, was in his car on his driveway when the event occurred. The collapsed property belongs to his friend and next-door neighbour Brian Loveridge, who was also at home when he heard a ‘terrible rumble’ that sent him and his wife (who thought the noise was thunder) rushing outside. Once outside, Mr Loveridge discovered that Mr Hall had climbed out of the shattered vehicle and was lying amongst the debris. He immediately alerted the Emergency Services, who were quick to respond with paramedics, fire crews and police. Afterwards, a shaken Mr Loveridge described the incident and said: “There was rubble and dust everywhere. Two cars were crushed flat… He (Mr Hall) had facial and head injuries; I’m a bit shell-shocked”. According to Mr Loveridge, his house had undergone renovations costing many thousands of pounds, including the installation of a new roof 18 months ago. 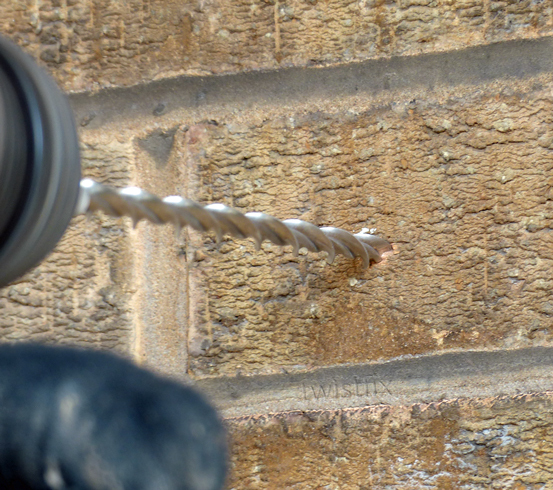 The outside wall had also been repointed just two months previous to the incident. The collapse of the wall is now under inves­tiga­tion. 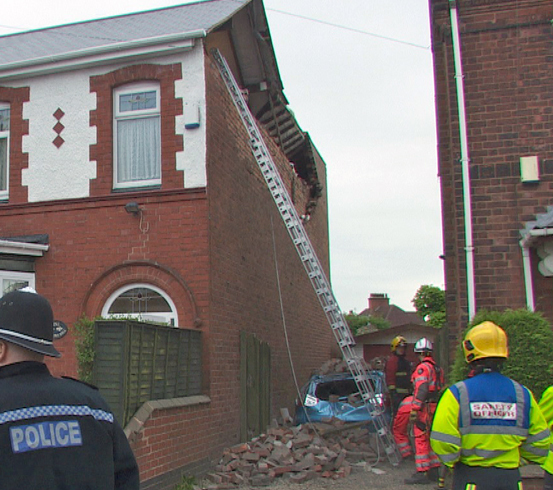 Lee Richardson, the Crew Commander at Smethwick Fire Station, said: “There’s been a partial collapse of the gable end. It’s probably the age of the building but nothing he’s done. We are here to make sure the building is safe for him and his neighbours”. Closer investigation revealed that a single leaf gable appex was supported on the outer leaf of the side cavity wall. 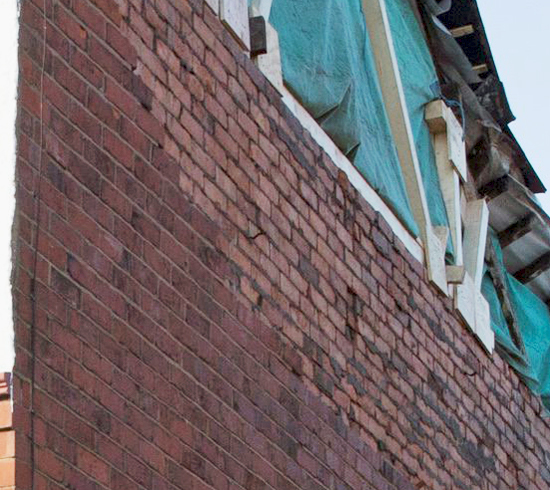 It appears that there are insufficient tie irons in the main cavity wall structure and the few that were in place had corroded at the connection with the outer leaf of brickwork.­ Additionally the single leaf apex was not tied to the roofing timbers and therefore there was no lateral restraint connection between the roof and wall structure. Missing or corroded wall ties are often the cause of structural failure and Twistfix have seen this type of collapse many times before. 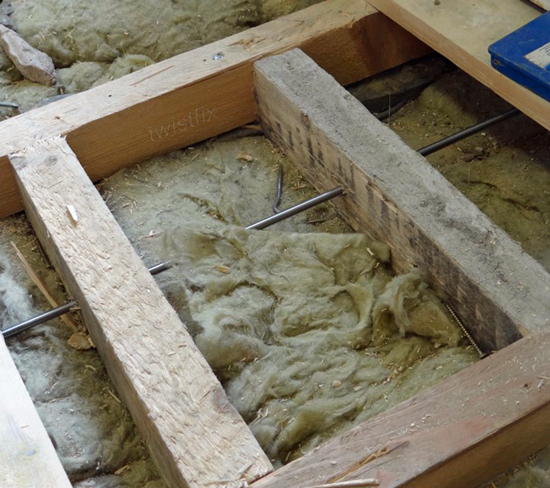 Our comprehensive collection of retrofit wall ties and structural anchors offer many benefits - find out more about these products and solutions here.